The demonstration had just passed, with its cohort of panels, slogans and flags. 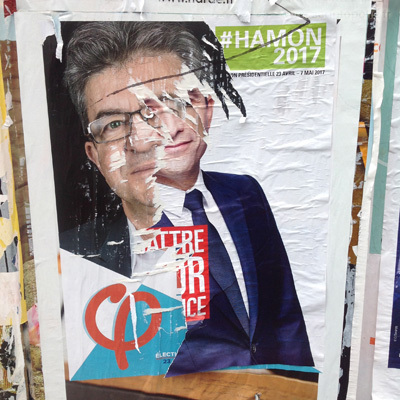 Behind it, its traces in the public space are quickly erased by the cleaning services, but the most diverse surfaces to accommodate the famous posters of the candidates. Indeed, despite the extension of digital spaces in political communication, the battle for urban spaces continues. No need to manipulate algorithms or to practice micropayments to be more visible, it is enough here to be the last to pass to cover the posters previously pasted. Unless a skillful hand tears the top layer and creates a new collage. If it is difficult to bring candidates closer to a common political offer in the debate arenas, the laminated space of the paper achieve an unlikely fusion.